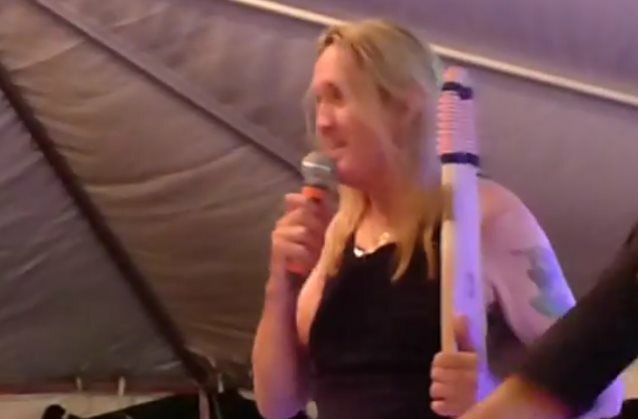 IRON MAIDEN drummer Nicko McBrain was presented with a special Navy SEAL fin in commemoration of his work benefitting the Navy SEAL Foundation. 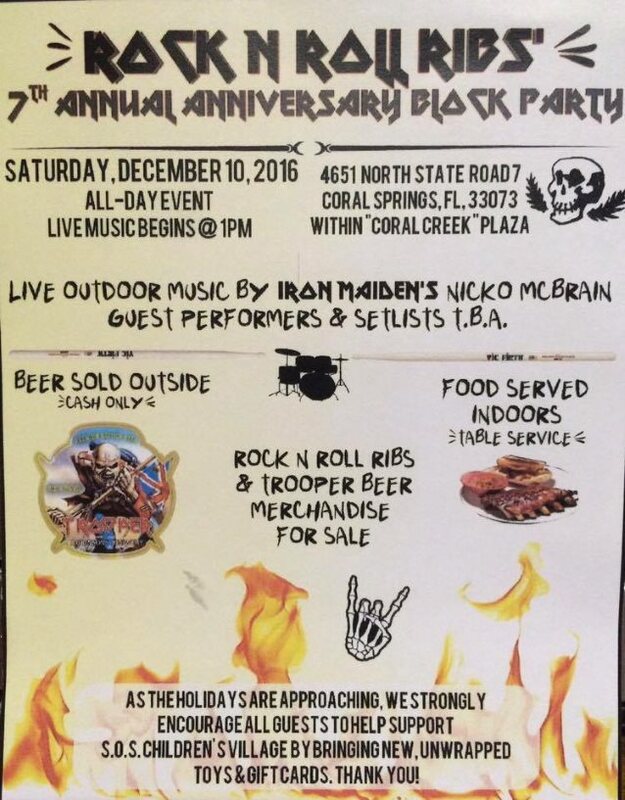 The presentation took place yesterday (Saturday, December 10) at the seventh-anniversary celebration for Rock N Roll Ribs, the barbecue restaurant owned by McBrain and close friend Mitch Tanne, in Coral Springs, Florida. Presenting McBrain with the fin was his friend, long-drive golf champion Mike Zeigler, who also plays bass in Nicko's band THE MCBRAINIACS. "I've been a bass player for 25 years," Zeigler told CantonRep.com in a 2015 interview. "I've played every kind of music you can think of, but I've always been a big IRON MAIDEN fan. Hooking up with Nicko was a thrill for me." THE MCBRAINIACS formed a few years ago after Zeigler met McBrain at an event hosted by Golf Channel anchor Rich Lerner. The pair hit if off, and McBrain suggested they hook up to jam across the country when he was on downtime from IRON MAIDEN. Zeigler was already playing in another band with the musicians that make up THE MCBRAINIACS, making for an easy transition. A barbecue joint with a musical bent, Rock N Roll Ribs showcases its love for smokey Southern cooking with food like barbecued pork and chicken and clever takes on MAIDEN songs, like "Run to the Hills" wings. "It's not just MAIDEN fans that come in," McBrain said about the restaurant in a 2010 interview. "We do get a lot of pilgrimages, people come in and look at all the stuff on the walls, but most people that come in always come out satisfied. And it's not major expensive. A rack of ribs is [$20], and you get a pound and a quarter to a pound and a half of ribs." Asked if he has always been a BBQ fan, McBrain told Broward Palm Beach New Times in a 2013 interview: "Yeah! You know, I'm a Brit, and we don't have a very long summer, so it's very few and far between people get out and do a barbie in the backyard. Touring around America, I always used to love buying a rack of baby backs and some cole slaw and French Fries, and that was my main BBQ experience, the baby backs. Then a friend of mine taught me how to make the ribs we make in the restaurant, and I started to make some sauce, and it was very successful and people liked it, and that's where Rock N Roll Ribs was born, really. It was a dream we had and it finally came into fruition. I've got to be honest, it's not a business that's making a lot of money for us, but we make a lot of people smile and a lot of people happy. I'm very happy, it's great! I love it when I meet people and they say things like, 'these are the ribs I've ever had,' or, 'Your pulled pork is to die for,' and it warms the cockles of me heart!"